Adding a variety of new food options to California store menus, Jamba Juice is giving us plenty of excuses to eat Jamba for every meal! Today, I had the opportunity to sample the entire new line of California Flatbreads, Grab and Go products, and Fruit Tea Infusions. These products will not replace any current products in the Jamba line-up, but rather will make Jamba Juice "more relevant to more people," according to Kim Larson, vice-president of brand marketing, who lead us through the initial product briefing. I think Jamba is on the right path with their new product lines. As Kim mentioned in her briefing, while many people can make a smoothie into a meal, others need that solid food product to chew on in order for the meal to be complete. Keeping in mind Jamba's goal to create all natural products, these food items are made of high quality, fresh ingredients. This post is the first of a series of posts over the next week that will walk you through the entire product line including the seasonal Blackberry Bliss smoothie. We will discuss the flavor profiles of the various products, allergy information, Uncovering Food's suggested beverage pairings, and finally what are the best low-calorie options on the menu. In addition to offering the new products, Jamba will also offer food and beverage bundles where you can save $2 on the bundle. Who doesn't like to save a couple bucks in this economy? And if a smoothie fills you up, I would still advise you to take advantage of the bundle. Add one of the Grab and Go menu items and toss it in your fridge for later! Jamba, which I learned is Swahili meaning "to celebrate," has found a way to celebrate even the boring cubicle lunch. Coming later this summer, Jamba will be changing things up to make lunch more exciting. Rolling out the "Brown Bag Bliss," Jamba's paper bags that are used to carry your meal will now double as a picnic "blanket" for your desk. You will be able to load music and scenic views on Jamba's Web site, and even post the provided picture of a "window" on your cubicle wall. Leave it to Jamba Juice to add an entertaining and relxing spin to a weekday lunch! I am also excited to get to play with the Brown Bag Bliss request, an opportunity to send customizable video requests for Jamba Juice to coworkers and friends. The hot California Flatbreads include: Smokehouse Chicken, Tomo Artichoko, MediterraneYUM, and Four Cheesy. The cold Grab and Go menu features wraps, salads and a sandwich. 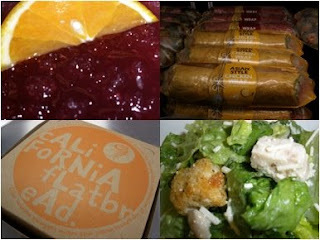 The options are: Greens and Grain Wrap, Asian Style Chicken Wrap, Chimichurri Wrap, Greek Goodness Wrap, Caesar the Day! salad, Couscous & Produce salad, and the Gobble'licious sandwich. Finally, the Fruit Tea Infusions include: Pomegranate, Passion Fruit and Prickly Pear. thanks for the great info on jamba and their new food...i cant believe they didnt do this earlier. this is big!!! i look forward to more posts on this topic. Thanks for the info about Jamba's new products. I've only gone there once, but those flatbreads sound delicious! im looking forward to try their new food items, looks great! AAH! I don't even have a Jamba next to me...I'm SO jealous! All those flatbreads and wraps sound amazing! I remember Jamba juice from when I used to live in California. Very nice that they are offering these flatbreads, sounds delish!